this post was created in partnership with blurb. i got put onto blurb years ago when i first started shooting -- roughly 8-ish years ago -- and remember being in complete and total awe that any regular person could self-publish 'a real professional book' about whatever their heart desired. i decided that one day i was going to make an awesome book about something and print it through the blurb platform, even if it was just one copy for myself. the layflat book format is blurb's fancy new creation that allows books to -- wait for it -- lay completely flat so you don't lose any part of your image to the center. aka you can have full bleed two page spreads that win at life more than any other two page spreads in existence. of all the things, why did i decide on making a photo portfolio? when i first moved to new york about six and a half years ago (i have no idea where the time went), i was looking into printed portfolios; i'd been researching a screw-post situation for which i'd have to buy inserts and then pay for prints -- the smallest size for maybe a 40ish image portfolio was going to run me like $600-700. i decided to opt for an ipad solution instead and that's what i've been rocking with since about 2012.
this blurb project finally allowed me to delve into the long-time-coming realm of printed portfolios in a new way and presented me the super valuable opportunity to practice laying out a photo book -- something i've never done before and is really its own art form. i prepared myself for a daunting task as i've been told that book and magazine layout design can be a beast. however, thanks to blurb's bookwright software and preset layouts to get me started with how things work and can look, the task was much more approachable than i thought it might be. and honestly, praise due to layflat book format for greatly expanding my layout possibilities and ability to play; i can imagine that with a limited gutter situation, layout options would be much more challenging. i felt so gleefully reckless splaying photos across the gutter on as many pages as possible. 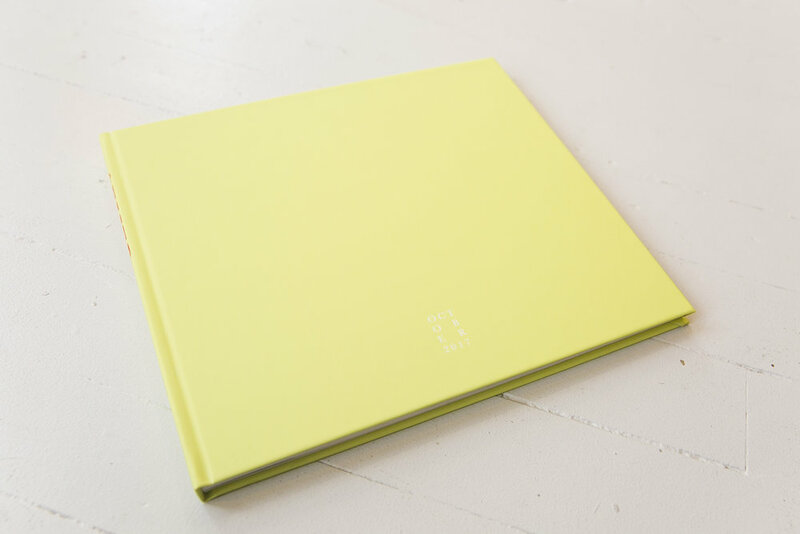 i got the large landscape style book and upon receiving it, i can tell you that the thing is not a casual situation -- it is an event; it is also neon grellow -- because, why not? the build of the hardcover is solid and the pages are substantial. to create the layflat effect, all the pages are essentially two 100 lb. stock pages glued together, yielding a luxurious page weight of 200 lb. in effect. not for the faint of heart. the opening page is my only full bleed spread in the book and really, i sort of made it by accident; i dragged the image in just to see what would happen and it looked so good, i kept it. the feel of this layout combined with the richness of the color in the print quality is especially bold and striking. the cost of the book with shipping came out to something like $250ish (which i luckily didn't have to pay, compliments of blurb). crazy that it was about half the price of the portfolio option i was looking at some years ago. that considered, i could see printing a portfolio like this bi-annually or quarterly as a real possibility for adding a special touch to portfolio review meetings; i find that photo editors really welcome and cherish the nostalgia and tactile nature of print. if you feeling extra fancy, blurb books can be sold on the blurb bookstore (which ships worldwide), apple ibooks, amazon, or via ingram (a distributor to many bookstores). 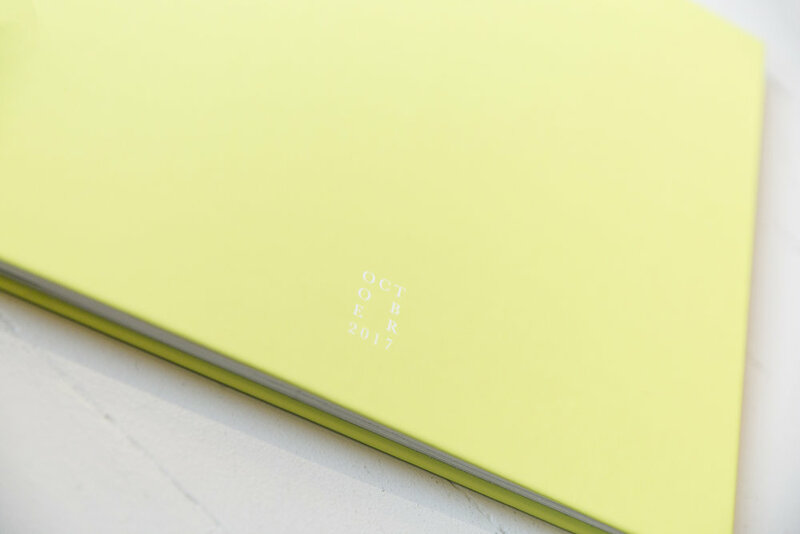 and if perhaps, maybe, you feel like getting your very own copy of my october 2017 portfolio from the blurb bookstore -- that can happen. how do you showcase your work or photography?